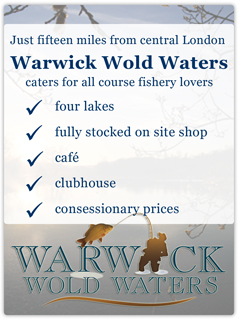 Opened in 2011, Warwick Wold Waters is a four lake commercial fishery located in the Surrey Hills between Merstham and Caterham. (A fifth lake is currently under development and we hope it will be available for fishing later this year). All the lakes are well stocked with a variety of fish but primarily with carp up to about 20lbs. In addition there are crucians, roach, rudd, tench, bream, barbel and perch in different lakes. There is a clubhouse which has a café where you can buy hot and cold drinks and a selection of hot food and sandwiches. Ladies and Gents toilets are available in the clubhouse. There is also a small selection of tackle, bait and groundbait for sale in the clubhouse shop/reception. All visitors should report to the clubhouse reception upon arrival in the fishery. The fishery is open on Fridays, Saturdays, Sundays and Mondays from 7.00am to 7.00pm and you can be assured of a warm welcome. All the staff are experienced anglers and will be able to provide advice on how to fish the various lakes in the complex. More detailed information about the fishery can be found throughout this website.